Ouch!’ Laurie yelped and sucked her finger. ‘Wuzz! That don’t hurt,’ said her sister Louisa. 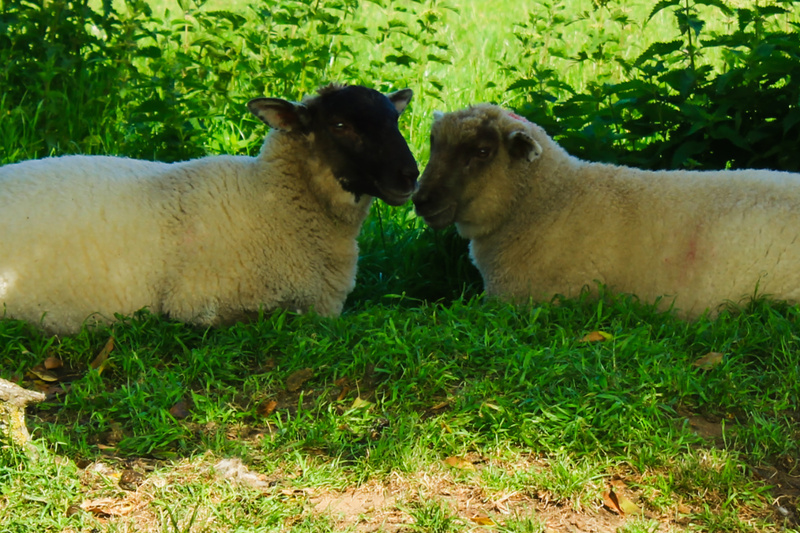 For those not country-bred, when the weather warms before the sheep are shorn, to relieve the heat and the itch, the sheep will rub up against anything rough. In days of yore the local children collected those tiny tassels of wool, gather enough and it might earn them some money. Written for Sammi’s Weekend Writing Prompt: 36 words. This entry was posted in Shorts and tagged Flash Fiction, Sammi's Weekend Challenge. Bookmark the permalink. Delightful and informative! love it Crispina! I thank you, Violet. I don’t usually go for Sammi’s prompts, but after that sheep on CCC, I could’t resist. And I have actually gathered wool that way. Great take on the prompt, and an adorable image. Plus I learned something about wool gathering, thanks! I was raised a country lass; I remember gathering wool that way. This is the difference between country and rural, I think, because I grew up with friends who had farms — but those were fields of corn and beans and grazing cows. No meadows dotted with sheep for me. The same can be said of various regions in UK. Where I grew up, the norm was small farms with mixed arable-livestock, and that livestock was chosen to make best use of the soils: so, an arable field might, next season, be turned to a sheep run, but never a cow pasture. It’s to do with soil composition but I’m not that up on it to explain it in full. Generall, sheep tend to be put to sharp draining light soils where the introduce organic matter which helps improve the soil so nect season it can again grow arable crops. while the coaws are most often put in riverside pastures, where the heavier soil produces a sweet grass, which in turn pruduces a sweet meat and ample milk. I feel like I should know a lot more about farming and soils and whatnot, given where I grew up, but nobody in my family farmed. So instead I know about history and religion and art and chamber music, which I’m not complaining about. Such fascinating experiences from a bygone era; there are few today who can say the same, other than traditional homesteaders. My good fortune was having a mother who preferred to farm me out every school holidays with my grandparents, and they, good old rural types. I’d take loads of books with me, and pen and paper. No electricity, no tv, no radio (unless it was battery=powered) and a candle to bed. Yea, truly, a bygone age. Yet the village was less than ten miles from Norwich, and the Beatles and Stones had already made it. Ah, that sounds idyllic to me now! But as a child, I probably would have been lonely without friends my age nearby (or my sister, who I spent more time with than with my friends until we were teenagers). Or perhaps I’m jumping to conclusions about how isolated your grandparents’ house was. There were other kids in the village; my aunt lived there too, so I had my cousins, one of whom boarded at the same school as me, though she was older. Otherwise, no, there were few of my age. I remember one Easter a new family had moved to the village with two sons, kinda Brian JOnes lookalikes (if you don’t remember him google him: a Rolling Stone till he died under suspicious circumstances.) Anyway, for whatever reasson I attracted the eye of them both. Woo-hoo! Probably because, not being village-born they thought me more sophisticated. Sophistication and street-wisdom is all relative to where you are, I suppose. And you find the pros and cons in every type of childhood environment; none has all the good and none of the bad (although some seem to have nothing but bad, and I feel lucky I wasn’t born into one of those). Said I was going for word-play. BTW: I’ve chosen Wednesday’s CCC photo. I reckon you’ll easily find a way to use it in your story about Lyr, though it’s not of the sea.